Two of our papers were accepted in the same issue of the Journal of Artificial General Intelligence special edition on WBE and Connectomics. These are available as open access. There are about nine papers in this edition on Whole Brain emulation all tackling different aspects of the mind upload problem. Two been written and co-authored between myself and Prof Sergio Pissanetzky (who came up with CML). Each paper is focused for different aspects of the problem, The first with primary author Prof Pissanetzky is the introduction for CML. The second where I am primary author represents the full realization of the approach described on this site, and is the progress from previous papers regarding how to approach deriving general mammalian computation from the biophysics of brain structure. But this had halted with a major problem. How consistent was this approach with both fundamental physics and information theory. i.e. If principles of intelligence are intrinsic to the evolution of brain structures that fuse complex amalgamations of proteins and biophysics, then these structural principles should be scaling in some kind of regular manner from fundamental principles of information. Regular neuroscience had no bridging theory for this problem but Causal Mathematical Logic has. CML describes how information algorithms self organize from the most fundamental physical principles (such as least action and entropy). Images below are from the primary paper "Causal Mathematical Logic as a guiding framework for the prediction of "Intelligence Signals" in brain simulations. Authors: Lanzalaco, Felix; Pissanetzky, Sergio"
Here we show how CML theory orders information in a manner analogous to cortical columns, simply by coding the principle of least action. The application of CML to the "go for everything" approach in the cortico-limbic system summarized on this site, now produces the first step towards a complete "information engine" model that unifies computational neuroscience and Artificial General Intelligence. Its also the first well defined approach to dual process theories in physical/neuro and AGi terms. Some of the justification from the paper follows. We summarize the brains oscillations, where they are located in the brains topology and whether these phase lock. The finding is most phase locking is limbic system and the clock sources are coming from the brains central structures. Much like an oscillation tends to settle into the equilibrium at the center of a thermodynamic system. 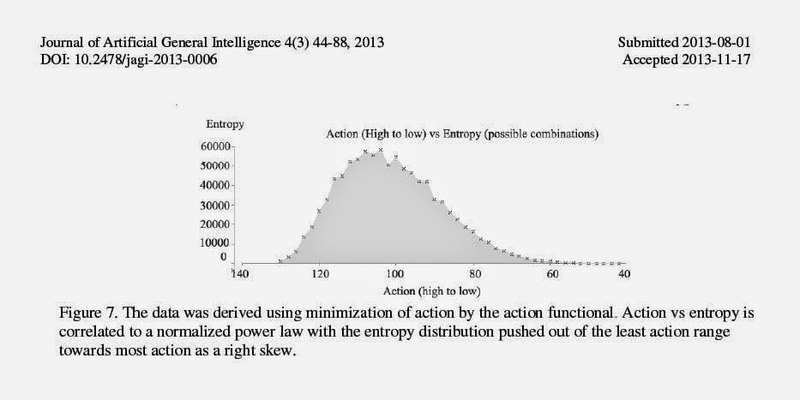 Using CML theory we find the relationship between action (high to low) and entropy. 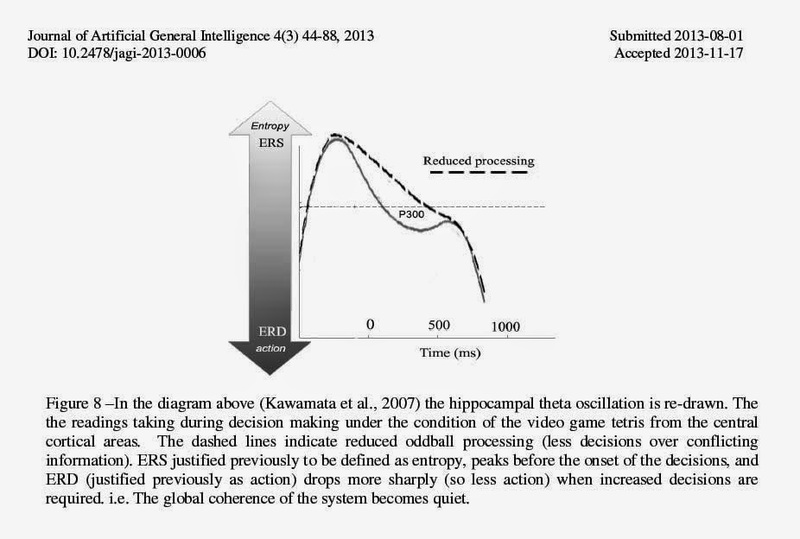 This should predict the primary contents for brain signals, that we had previously formalized action as ERD and entropy ERS. You will need to check the paper for an explanation. There were some problems (check the paper). But the relationship is verified as similar. Bear in mind this is still a correlation that rests on the papers more refined presumptions about physics of brain structure. Read the paper to find how the physics basis is already existent in many other works. 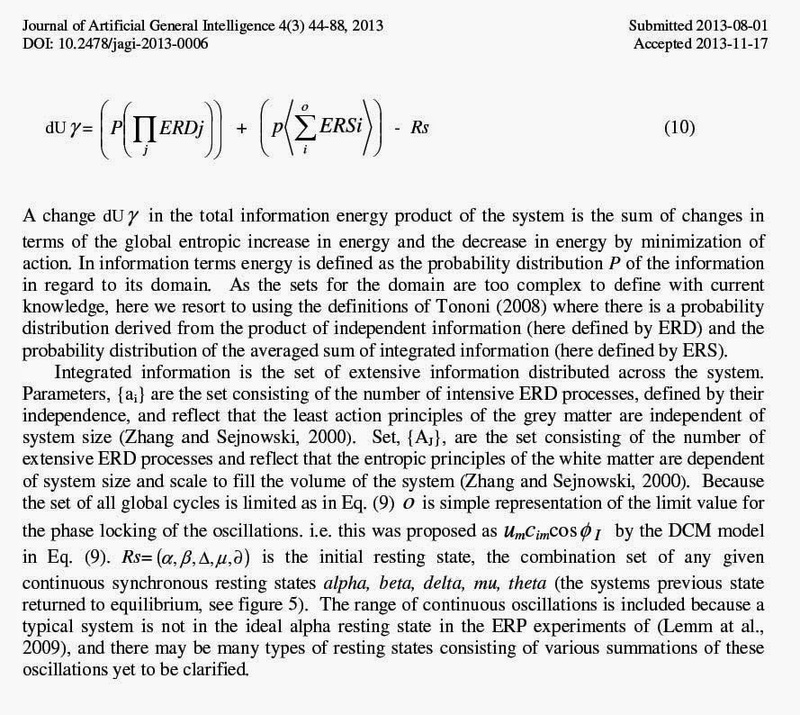 An attempt at a formalization for this approach in thermodynamics the recruits some definitions from integrated information theory (IIT). This formalization is veerinng away from the direction proposed by Prof Pissanetzky and is influenced by some aspects of Alex Wissner Gross Freer. The idea is that we make action and entropy equivalent. 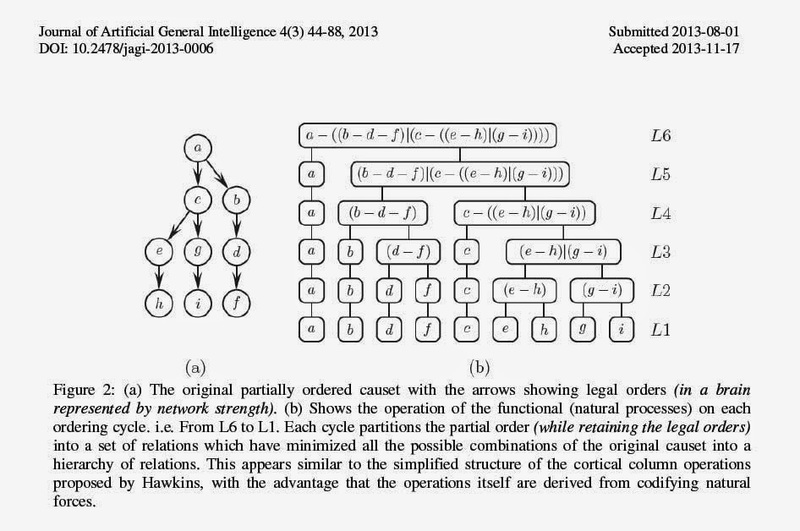 Something which is strongly resisted in the computational sciences right now, primarily because describing and formalizing the processes of order in information is so important. But I dont buy it. Coming from a neuro view I think Alex Gross description of entropy hits on the physics formalization for one part of common dual process formalization for intelligence. For a video of Alex see here, and for a wiki summary of dual process theory see here. And where next ? This approach has to explain all these brain features in terms of physics and information theory. Many of the above are being considered essential for Artificial General Intelligence. I have been collaborating with other colleagues in regard to this. Again watch this space. 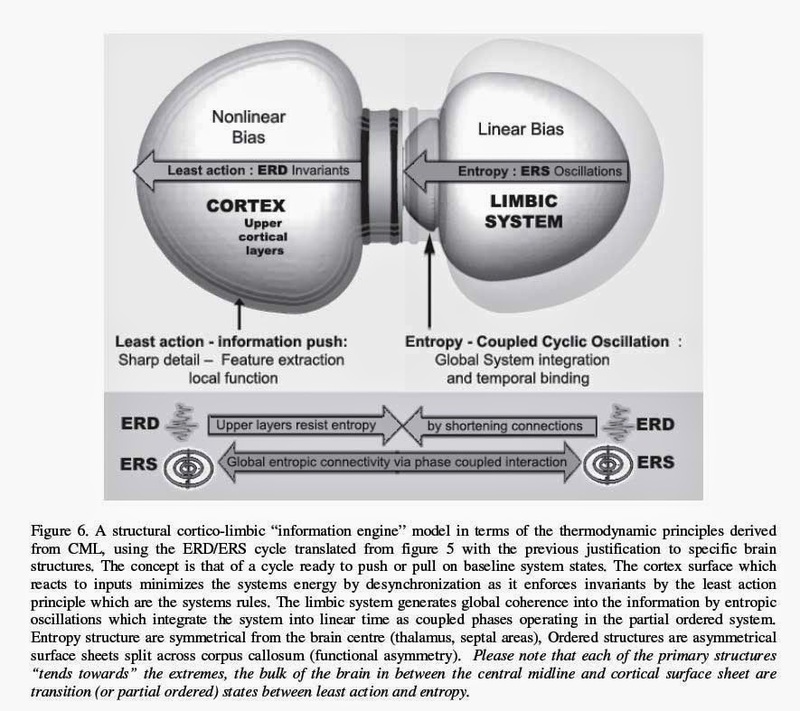 The point regarding brain simulation, is the basic idea is that a brain simulation (or emulation) has to run on a thermodynamically responsive system. Especially as brain simulators become more generic in form. 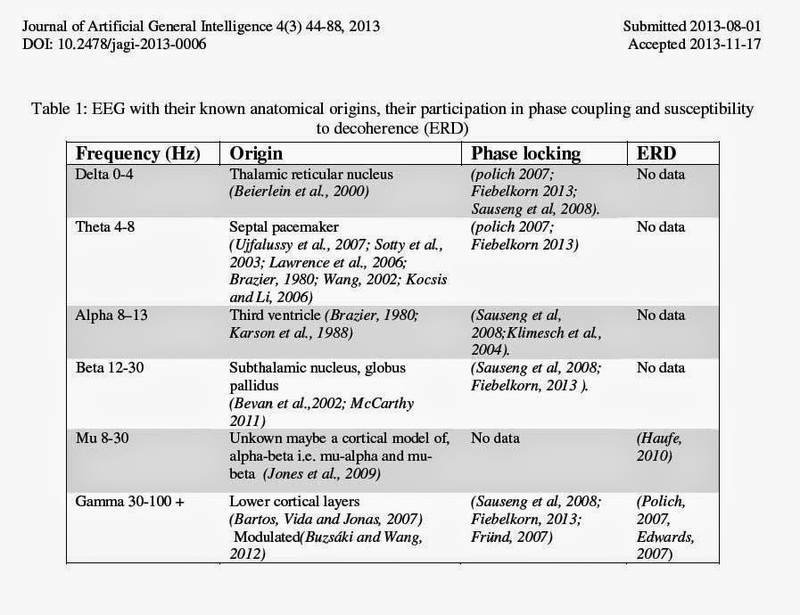 All the process of transcribing the details of the neural parts can be done by current methods, but if its going to be conscious (a word i don't like using).. or better term to "process integrate/ dynamically" and reflect as we do.. it will have to produce EEG to generate Event Related Potentials.. and these are best described or understood by CML (or something similar) in terms of thermodynamics. The good news is this predicts no esoteric quantum physics will be required.. and a thermodynamic brain simulator (or emulator) will hopefully work fine without such extreme details. The Quantum mind objectors will say that Quantum mechanics is still thermodynamic. My reply is we only need to go for the physical theory which describes the thermodynamic resolution the information operates on. Almost all of the neural mutational complexity produces mechanisms at the synapse to glial level. If the thermodynamic description is enough for the entire physical description at this scale, then that means this proposal is the start of a new general physical model for simulators/emulators based on mammalian structures. The other paper where Prof Pissanetkzy is the lead other here describes more of the mathematical and philosophical foundations. There is also a supplementary section for the above paper linked to here called "Can CML predict solutions for outstanding questions in Whole Brain Emulation (WBE) ?" This will be updated also with the accepted peer review points. I was not successful in procuring the labtime from Edinburgh University, to falsify which mechanism produces the dipole flow in development. We need this mechanisms falsified. If is verified we then have a strong justification to propose that the FET flagship Human Brain Project would need to model the cortical column model in the context of the dipole model. This work is competing with many traditional applied projects that are directed towards curing medical disorders. Good news is it appears other researchers in Scotland have been discovering dipole flow in neurodevelopment. i.e. This study from Prof. Timothy Newman at Dundee, College of Life sciences. So it appears the dipole-multipole concept lab results are appearing as I predicted way back which is vindicating. But as with the work from Vincent Fleury's Lab in CNRS Paris. I am still not in agreement with these labs on the mechanism. That was the point for my lab request. I predict that Ca2+ flow through the Connexin, Pannexin network in and out of the Radial Glia provides Magnetohydrodynamic flow giving rise to generalized cortex wide guidance pulses for electrotonic components. i.e. Guidance molecules, Intracellular ion gradients and astrotactin adhesion for neurons moving along the Glial fibers. There is more on that on this site here. For those new to this concept, I justify the application for this dipole force in development applying to mammals based on the indirect data meta-analysed from my 2009 publication, and the evolutionary roots of the cortex, which pre-date Clade Avialae (birds !) back to the roots in phylum chordata (sea creatures). A post on that issue here, based on the bio-informatic regression of synapse carried out by the genes to cognition project of Seth Grant. There have been other studies summarized by a scientific american article which reached a similar conclusion.